Thanks to Dana and Will Rousmaniere, from whose excellent around-the-world web site (www.rousmanieres.com) we lifted these questions. It just made sense, seeing as we were often asked the same ones. Why travel around the world? Actually, our reasons for going were the same ones that many people list when they dream about traveling the world: experience different cultures, meet people who live differently than we do, visit natural wonders, have a little adventure, etc ... . The question we were more intrigued by, however, was "why us?" Many people dream and talk about traveling the world, but we actually took the next step and did it. What made us different? Still have no idea. There is another reason for going, as well. Not long after we were married we drew up a "Lifes List:" things we wanted to accomplish during our lives. We were eager to cross something off the list and, believe it or not, traveling the world was the most feasible one. How did you decide when to go? We had talked about taking this trip since before we were married and decided there were two options which would work for us: go before we had children, or wait until after we retired. In the summer of 2002 we realized if we didn't take the trip soon, within a year or so we would have a child or a house and it would be 30 years before we would go. We decided to make the jump then. You've heard of traveling on a shoestring? We tried to do it on dental floss. The most economical way to travel, however, varied depending on the country. An nearly-comprehensive list of modes of travel would include: our car, planes (5 flights bought beforehand, 4 bought on the road), all types of buses, hitch-hiking, trucks (lumber, vegetable, etc...), horses, bicycle, jeeps, walking, motorcycle (both with and without sidecar), rental cars, boats (ferries, sailboat, canoes, kayaks), and trains. Did you quit your jobs? Yes. The television industry is a very competitive one. Companies are not likely to hold a job for someone for a whole year. In fact, Garvin's replacement started working two weeks before he had even left his job. How did you get the news, especially with the war? Keeping up with world events is not as hard as many imagine. Internet cafes are located in cities, both big and small, all over the world; so it was not difficult to find news if you wanted it. If we were somewhere so remote there was no internet (as in Laos, during the war) we were able to keep up with the news listening to the BBC at night on our shortwave radio. The shortwave radio also proved a lifesaver (almost literally) when it came to the SARS virus. It was on the BBC we heard how bad the situation had become in China, just days before we were to enter that country. Based on that information we altered our plans ... a decision that, in retrospect, was the very right thing to do. How did you plan the trip? Most of the planning we did before leaving (we made the decision to go about six months before we left) was dedicated to organizing our affairs at home, rather than planning what we would do on the road. Before we left, all we had done was pick a rough route (east to west) and purchased five one-way tickets for certain stretches. Thats about it. During our trip across the United States we would often ask each other "Once we get off the plane in New Zealand what then?". The answer to that question (and most future ones) was: well figure it out when we get there. How did you afford to travel around the world? We are not independently wealthy. We did not win the lottery. We did not strike it rich with an internet IPO. What we did do was save as much as we could. We were helped by not having credit card debt, and were able to keep our living expenses as low as possible (only one car, brown bag lunches, no coffee out). Another way to look at it, we saved about enough for a down payment on a house, then didn't buy the house. When all is said and done, we estimate the total cost to be about $30,000. We spent about $5,000 on plane tickets before we left, and another $3,000 for tickets on the road. We spent another $5,000 before we left for things such as storage, camping and photography equipment, travel medical insurance, shots and prescriptions. On the road, we averaged roughly $50/day for both of us. That included all food, lodging, ground transportation, activities, and the (few) souvenirs we bought along the way. We obviously spent much less than that in some countries (in Laos we often stayed in places for $1/night and ate full dinners for $2.50) and much more in others (one night in a youth hostel in Hamburg, Germany cost more than $60 ... for dorm beds ... in separate rooms!). We each carried full size backpacks. Although they started out much, much too heavy, by the time we hit our stride Garvin's weighed roughly 40 lbs and Karen's closer to 35. Making ours a bit heavier than most, we carried camping equipment with us the whole way (tent, sleeping pads, sleeping bags, and sometimes cooking equipment). Although a pain to carry at times, the tent enabled us to save quite a bit of money along the way and experience some places that we couldn't have visited otherwise. What was in the packs was constantly evolving with the location, the style of travel, and the weather. Periodically we would mail home a package with some things we no longer wanted to carry, along with any souvenirs and mementoes picked up along the way; and when needed we picked up some clothes, very cheaply, in places like Bangkok, Ulaan Baatar, or Bolivia. During the last week of The Enchilada as we were sitting in our room in La Paz, Bolivia ($5/night) Garvin looked around and said, "if we ever walked into a room like this in a hotel or motel in the States, we would probably just turn around and walk right out." Funny thing is, at that same moment, Karen was thinking what a nice, clean room it was. And you know what? She was right. 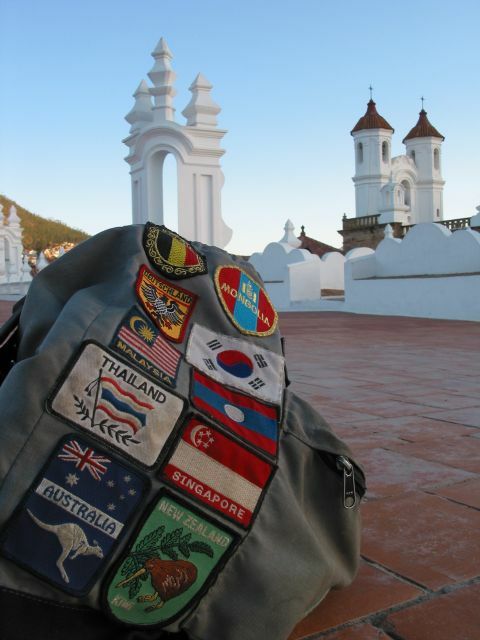 It is just your standards are a tend to lower a bit when backpacking around the world. We camped many times (perhaps 100 nights over the past year). In New Zealand, South Africa and some other locations we stayed at places called "backpackers". They are something like youth hostels, but not quite. They have dorm rooms and some doubles, almost always with a shared bathroom. We often would camp out on the lawn for half the price of staying indoors (and with more privacy than a dorm room). Backpackers almost always have a kitchen you can use to prepare your own food (saves the cost of eating out). The best thing about them, though, is they specialize in providing information about the area for independent/budget travelers. We also made the most, wherever we could, of the hospitality offered to us by locals. Many were friends of friends of ours from the States. We also took advantage of our membership in Servas (www.servas.org), an organization that allows you to stay in a host family's home for a few nights for the purpose of cultural exchange. We enjoyed Servas visits Thailand, Portugal, South Africa, and Argentina. Other than that it was guest houses (by many different names in many different countries) and the occasional overnight plane flight, bus, or train trip. By the way, if your ever in the neighborhood, we would like to plug two of our favorite places to stay: UB Guesthouse in Ulaan Baatar, Mongolia and The Green Elephant in Cape Town, South Africa. Tell them Garvin and Karen sent you. How did you get money/pay your bills/do your banking? Technology sure has made some aspects of world travel a lot easier than it used to be. Money management is one of them. Bills (and it was really just the credit card) were paid over the internet. We also left a few personal checks with our parents to take care of incidentals. For emergencies, Karen's father was given power of attorney. Thankfully, it was never needed. How did you do your taxes? We didn't. Yet. We applied for and received (with the help of Garvin's father) extensions that are good until January 2004. We both did. We shared the picture-taking responsibility and enjoyment evenly. Some people have also asked about our equipment. Before leaving, we purchased a Canon Powershot G2. We couldn't have been happier with the ease of use, number of options, picture quality, battery life, and durability of the camera. The only thing more we could have wished for was more telephoto (the G2 has 3x optical zoom) for taking wildlife pictures, and a polarizing filter for that harsh South American sunshine. As for picture storage (we ended up with more than 2,000) at first, we traveled with a small portable hard drive called a Mindstor, which is specifically tailored for downloading digital photographs. We would then (about once a month) download the contents of the Mindstor onto a computer at an internet cafe and then burn two CD's (one to mail home, the other to carry). The Mindstor was not without its bugs, and finally crashed and burned three months into the trip. Fortunately no pictures were lost. We then bought a 512mb card (which held up to 250 pictures) and followed the same monthly/burn pattern. We both feel a digital camera (as opposed to film) helped us take better pictures. The ability to see our mistakes immediately (and delete them) allowed us to experiment more, take more chances, and become more creative in our picture-taking. How did you get your mail? Before leaving, we changed our official address to that of Garvin's parents (we had given up our apartment) and Garvin's mother let us know if anything out of the ordinary came in the mail (it rarely did). How did you keep in touch with people back home? As mentioned before, unlike the United States (where a majority of computer users have pc's in their homes), there are internet cafes in practically every city of almost any size anywhere in the world these days. Of course (seeing as you are reading this) you are aware of our web site as well. It probably took us a total of ten hours on-line to do an update of our web site, depending on the connection speed and the temperament of Tripod.com, our web host. Their site-building software made doing the updates very easy, if not always very fast. How do you think the trip has changed you? Tough question. There were no earth-shattering, life-altering revelations on the road for either of us. We didn't really expect there to be. We think the ways in which we have changed will become apparent to us over time in many, many small ways rather than just a few big ones. Did you get sick, robbed, etc? For being on the road for an entire year, we were blessed to have encountered very few problems along the way. We did get sick a few times (Karen with a sinus infection in Bangkok, Garvin with a five-day fever in Bolivia to name two) but managed to avoid almost all problems with our stomachs ... until, that is, the LAST WEEK of the trip. The travel gods looked down upon us, realized we were about to escape home without experiencing some real intestinal discomfort and did something about it in Copacabana, Bolivia. Thank goodness for Cipro. We did have some money stolen from a guesthouse room in Seoul, South Korea, and had a camera bag taken (without the camera, fortunately) in Laos. We also had one very bad night at a campground in Botswana thanks to a group of very drunk British youths. But again, for a year on the road, we feel very fortunate that was it. Was it hard to travel together? After one year of 24/7 we still feel very good about ourselves and each other. Sure, we had our share of spats, but really no more than we had our first (non-traveling) year of marriage. One reason, we feel, for our success were some clearly stated and understood goals for our trip established before we left. For example, one priority of the trip to meet people along the way who do not normally deal with tourists. That helped to guide us in making many of the decisions we faced along the way. We were also of the same mind when it came to the budget. It was usually the cheaper, the better. Also, we wanted to remain as flexible as possible during our travels, to be able to take advantage of whatever fun/exciting/different opportunities which may come along. It seems the most common problem among travel companions is that one is a plan-every-little-thinger, the other a fly-by-the-seat-of-their-pantser. Because we were both on the same page going into the trip (much more the latter than the former), that really reduced the number of conflicts on the road. Are you going to write a book? This was perhaps THE most asked question. The best answer is: we have no plans at this time (sounds like someone contemplating a run for office, doesn't it?). Through our previous jobs (as television reporters) we were privileged to experience many fascinating things and places, but always through the filter of work ("How will I tell this story? What questions do I have to ask? What video will I need?"). We wanted to experience this trip un-filtered. If we had gone in expecting to write a book, that would always be in the back of our minds. Our decisions might be influenced by what "would be good for the book" rather than what we honestly wanted to do. We desired to travel for the sake of travel, meet people for the sake of meeting them, try different foods for the sake of trying them, nothing more. But, now that we're back, if we have some ideas ... who knows? A close second to the previous for being the most asked question ... perhaps number one for being the most difficult to answer. Instead we'll answer the question one friend asked: "What were the best and worst parts of each place you visited." Best: Camping. OK, we got snowed on a lot, but we had the campgrounds to ourselves, we saved quite a bit of money, and got comfortable with our portable accommodations. Worst: Did we mention the snow? Best: Natural beauty. Also, a travel network geared specifically to the independent "backpacker." Worst: Being our first international destination, and early in the trip, we had yet to really settle into a comfortable rhythm of travel. We rushed a bit too much, tried to see bit too much, didnt stop and smell the roses enough. Best: From the Cruickshanks in Kempsey, to Shippers in Sydney, to the Bensons in Balingup, we got to know some great Aussies (and some very different Aussies) very well. Worst: From the Great Barrier Reef, to Ayer's Rock, to Melbourne we didnt see any of them. We have to go back later and do the tourist thing. Best: Our first chance to spend some time with people who truly live differently than we do. The culture of the hill tribes in Laos hasn't changed much in centuries. Also, our Servas host in Bangkok, Meaw. Her introduction to Thai food was invaluable. Worst: You would think traveling six hours north by canoe from Luang Phrabang, Laos, then hiking two hours into the hills would get you off the "beaten track." Not necessarily. Best: South Korea: Street food, friendly people. Mongolia: Want to get off the "beaten track?" Take two steps out of the capital, Ulaan Baatar. More than any other place, we achieved our goal of meeting people here who do not regularly meet tourists. Worst: South Korea: $100 stolen from our guesthouse room in Seoul. Mongolia: The guide for our five-day horse trek. Its not that he was a bad guy, it's just that the horses had more personality. Best: Hitch-hiking from Berlin to Amsterdam. Also, our ex-bullfighter friend Rui in Villa Franca de Xira, Portugal. He took us under his wing and introduced us to a world we couldn't have seen without him. Worst: Travel Europe by rail? How quaint. How romantic. How expensive! We took the bus. Best: The animals. Simply something you can't see anywhere else in the world. Worst: Paranoia in South Africa. So infectious we were reluctant to travel to certain places and meet certain people. Justified? Don't know, we were too scared to challenge it. Best: Ahora, Nosotros hablamos un pocito Espanol. (We can speak a little Spanish now). Worst: Trout in Copacabana, Bolivia. A moment on the lips ... a week in the bathroom. Any questions we forgot? Please, ask away.